Professor Kristen Walker's social media marketing students working with KCSN to bring in a new listener demographic for the nonprofit radio station which broadcasts from the university campus. Photo by Lee Choo. 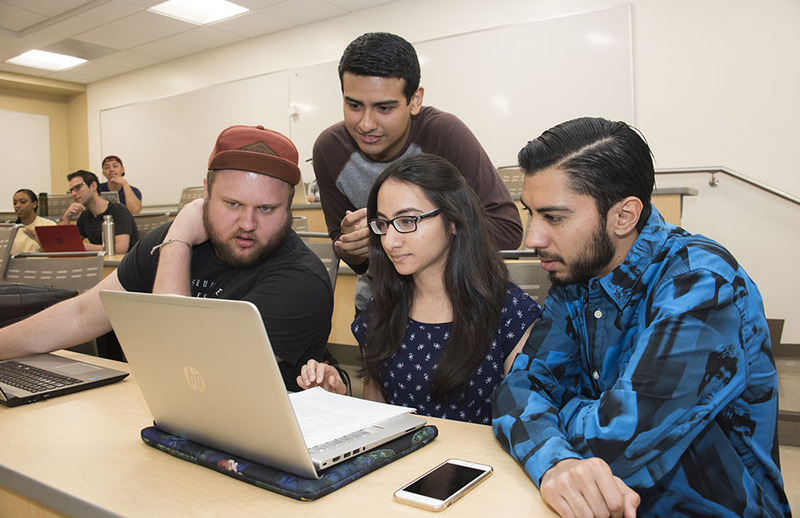 Team members Brandon Stables (Marketing), Brando Mayorga (Marketing), Aarti Khurana (Management/Interactive Marketing) and Rudy Rodriguez (Marketing) working on the situational analysis portion of their social media project. The class is broken up into six student teams that are all working on the same project, but allow for different perspectives. Photo by Lee Choo. 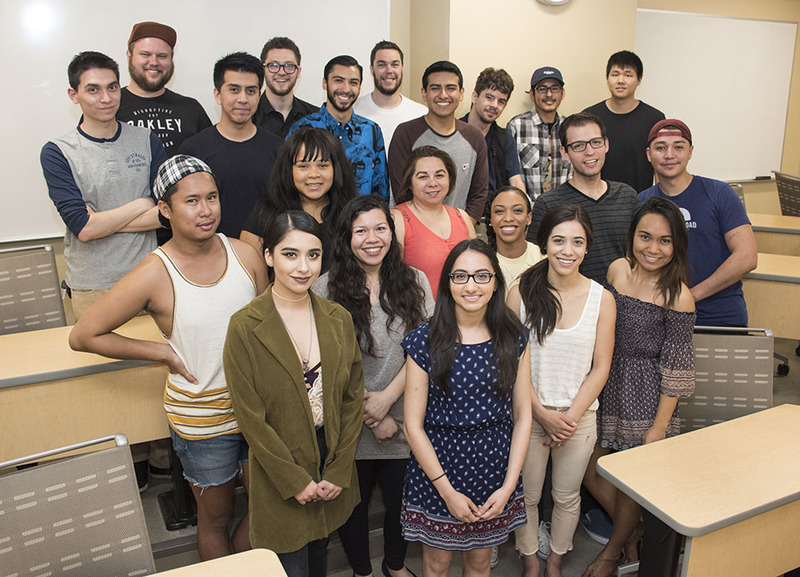 Senior marketing students from California State University, Northridge are working closely with KCSN 88.5 FM/Los Angeles, the public radio station broadcasting from the university’s campus, and its social media accounts to expand the station’s audience to include millennials. During the fall 2016 semester, Walker met with Daniels, CSUN Vice President for University Advancement Robert Gunsalus and KCSN Assistant Program Director Jeff Penfield to discuss plans for having KCSN as the client for the social media marketing class. The class is taught as a seminar and project-oriented class, which builds on the marketing and business coursework students already have completed and provides useful analysis and applications for a client. The undergraduates were tasked with creating and developing integrated marketing campaign concepts to increase millennial awareness and engagement for KCSN’s programming. KCSN is a noncommercial radio station and receives all of its funding from government sources, memberships or one-time donations from its listeners. With help from these marketing students, KCSN staff said they hope to build a stronger affiliation between a younger listener base — millennials — and the radio station, in order to develop lifelong listeners. The marketing students began by conducting a situational analysis, which involves reviewing the radio industry’s internal and external environments and factors that are relative to KCSN. They identified KCSN’s strengths and weaknesses, as well as the station’s opportunities in the market and potential threats. The recommendations and social media strategies students have been developing over the past couple weeks are not available at this time, but will be after they present their findings to KCSN. Walker said projects like this one are notoriously demanding for students, due to the fluctuating environments their clients face. However, she said, this challenge is the project’s most rewarding aspect. “They force students to be adaptable to changing information and, as a result, flexible with their campaigns,” she said. Students had to overcome obstacles such as working with teammates who do not always see eye-to-eye, and long, sleepless nights while researching and fine-tuning their work, but many said the payoff has been well worth it. Brandon Stables, a marketing major, said working on this project has taught him a few things about the business industry and being a marketer. Aarti Khurana, a management major with an interactive marketing minor, said she is glad she took the class because it has been a great hands-on learning experience. The students’ industry findings, social media strategies and recommendations will be presented to KCSN during finals week on May 16.